Waking up to birds chirping. A dip in the pool after breakfast.The smell of the earth after rain. Hanging out with friends and family. Chasing butterflies. Come live life at Siddha Happyville. It's sheer bliss each day. Where peace of mind meets a cocoon of luxury. In a panorama of fun and frolic. 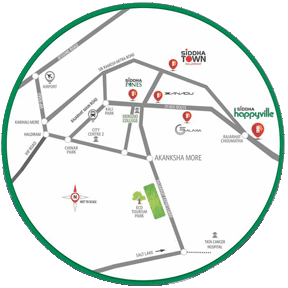 Siddha HappyVille Flats are located just 10minutes from City Centre II and the 6-lane Rajarhat Expressway.